Honor-based violence (HBV) is a crime committed to protect or defend the honor of a family and/or a community. It is usually triggered by the victim’s behavior, which the family and/or community regards as causing offense or dishonor. HBV has existed for thousands of years but has only very recently become a focus of law enforcement, policy makers, and statutory and non-statutory agencies. 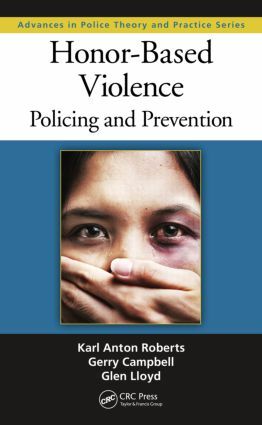 A volume in the CRC Press Advances in Police Theory and Practice Series, Honor-Based Violence: Policing and Prevention is designed to assist all those who confront these crimes in understanding what HBV is, how it can be recognized, and how we can support the victims, families, and communities that experience it. The research and best practices are drawn largely from the work done by the Violent Crime Directorate of the Metropolitan Police Service (London, UK) managed by authors Gerry Campbell and Glen Lloyd. The accessible style of this text makes it a valuable resource for law enforcement and policing professionals who investigate these crimes and a suitable textbook for policing and criminal justice courses. Karl Roberts is a forensic psychologist and professor of policing and criminal justice at the University of Western Sydney in Australia. He also has a joint appointment as associate professor of Criminal Justice at the University of Massachusetts, Lowell. His specific areas of expertise are within the broad field of interpersonal violence and law enforcement investigation, focusing on psychological and behavioral assessment of offenders, investigative interviewing, and threat assessment and management. He has particular interests in the psychology of honor and honor-based violence, and threat identification and management of violent crimes, such as stalking and honor-based crimes. He also has expertise in investigative interviewing by law enforcement and other agencies and has published a number of papers. He works closely with law enforcement and other agencies throughout Australia, the United Kingdom, Europe, and the United States providing training and advice to investigations in the form of threat assessments and investigative strategies. To date, he has provided advice to over 450 major police investigations. Gerry Campbell is detective chief superintendent with 26 years of service in London’s Metropolitan Police Service (MPS). He is currently the borough commander in central Inner London. He also is currently the United Kingdom’s Association of Chief Officer’s deputy lead for honor-based violence, forced marriage, and female genital mutilation. He co-authored ACPO’s first honor-based strategy. While leading high-risk operations, he has also led Scotland Yard’s policy development relating to public protection including domestic violence, honor-based violence, hate crimes, and the management of registered sexual offenders and dangerous offenders. He has chaired and led a number of strategic groups relating to these crime genres and has been an important part of key national strategy groups. He has worked with the U.K. government and law enforcement and NGO colleagues from around the world including the United States, Sweden, Denmark, Germany, Iraqi Kurdistan, Pakistan, and Australia. Glen Lloyd is a detective chief inspector in London’s Metropolitan Police Service (MPS). He is currently working as a senior investigating officer in the Homicide and Serious Crime Command where his responsibilities include murder and other serious crime investigations. In his 21 years of service, Lloyd has served on some of London’s most challenging boroughs, investigating a wide variety of crimes as well as managing many criminal investigation departments from major crime, burglary, and robbery as well as within the field of public protection. He worked with co-author Gerry Campbell in the MPS’ Violent Crime Directorate where they had the lead for service delivery of HBV across the MPS. This involved working with Her Majesty’s (HM) government, ACPO (Association of Chief Police Officers), strategic partners, and nongovernmental organizations (NGOs) in developing and enhancing the MPS’ response to HBV. This included providing both tactical and strategic advice on many and some of the most high profile HBV investigations in London and the United Kingdom.